Above: Stunning scenery lines Cumbres Pass, just south of Colorado. Photographs by Stefan Wachs. The train has stopped again so the crew can rotate, and fireman Jonathan Jones hops up into the gondola car after taking his shift. It’s a sunny June day and he’s been shoveling coal into the roaring, hungry maw of Engine 484 as it pushes hard to haul our load of freight cars up the 4 percent grade to Cumbres Pass, near the Colorado state line. He’s sweating and out of breath as he wipes his brow, replaces his cap, and shoves his gloves into the pockets of his overalls. But he is buzzing with energy, eyes gleaming, grinning from ear to ear. “Whoo!” he hoots, two triumphant Rocky fists punching the air above his head. “That was awesome!” He looks like a seven-year-old just off his first roller coaster at Disneyland. But Jones, a 48-year-old architect from Brooklyn, has basically died and gone to heaven. He’s in the heaven he pictured when he was 12 and first started fantasizing about driving a real locomotive. Here in Chama, at the Cumbres & Toltec Scenic Railroad’s Engineer & Fireman School, that lifelong dream has finally come true. 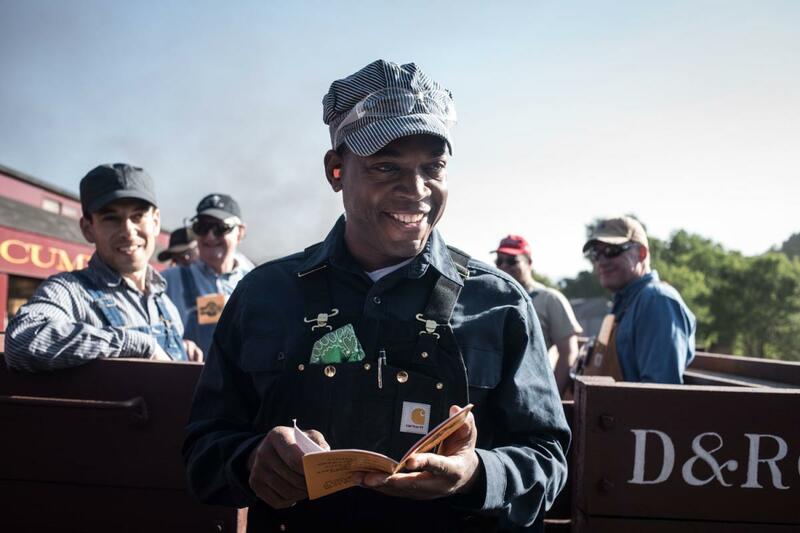 During the four-day beginner fireman program, Jones and his fellow students will help run a 1920s steam engine, learning how to throw shovelfuls of coal into just the right spots in the firebox to produce enough steam to power the 350-ton train up a mountain. Meanwhile, fireman school graduates in the beginning engineer class learn to control the flow of that steam into the cylinders, adjust the throttle, apply the air brakes, monitor the track, and give various signals with the correct combinations of short and long pulls on the whistle cord. Read more: Old Man River—A legendary fly-fishing guide faces down the years in the waters that have been his salvation. Jones has traveled 2,000 miles from New York City to go 100 years back in time, and he has paid $2,250 for the privilege of working on the railroad all the live-long day for four days, while every other sensible person in Brooklyn is in the kitchen with Dinah, toiling over a Blue Apron salad. In an era when many of our experiences are virtual, this little town in northern New Mexico attracts people from all over the world for the primal feeling of driving a train. 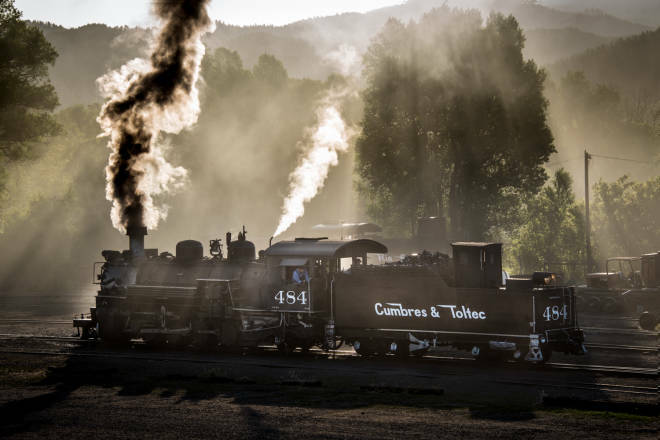 They come here because the Cumbres & Toltec offers something rare: a narrow-gauge railway that looks and functions almost exactly the way it did 75 years ago, and not much differently from when it debuted in 1880. “This is about as real as it gets—all the equipment here is what they actually used,” says student Paul Jones, who works on modern trains in Bloomington, Illinois, and volunteers on a small steam-powered tourist ride nearby. This stretch of line, between Chama and Antonito, Colorado, was once part of the vast Denver and Rio Grande Railroad, built for the challenge of pulling loads of silver ore out of the mountains. In its heyday, the network was one of the largest narrow-gauge railways in the world, with nearly 3,000 miles of nimble, switchbacking track laid up and over 10,000-foot peaks. Although a few stretches of the old system still run tourist trains (including Royal Gorge and the Durango and Silverton), the Cumbres and Toltec remains the longest, highest, and most complete. The students are almost all men (only two women have ever signed up), but they form a virtual Breakfast Club of unlikely comrades: Jones, the Brooklyn architect, meets a Canadian prosecutor, a Los Angeles pianist, a Denver public relations man, and a retired Presbyterian minister from Arizona, here on a thank-you trip paid for by his congregation. “Steam locomotives have so much character, and they’re so visceral,” Jones says. “We’re used to pushing a button and something happens. Here, nothing happens unless you pull something, push something, or set something on fire.” This week, Jones is mostly in charge of setting things on fire, and I follow him up to the cab for his next shift. When instructor Harry Haas gives the signal, Jones pivots from his somewhat precarious position between the locomotive and its tender, shovels a load of coal, and steps on a pedal that parts the thick steel butterfly doors of the firebox. A wall of heat blasts his face as he leans in and aims the shovel, trying to build the perfect horseshoe-shaped bed of coals, as Haas has described. After a few minutes, he trades places with another classmate, taking his seat on the left side of the cab, watching the track and monitoring gauges as the train chugs rhythmically—I think I can, I think I can—up the hill. Above: Students learning about the work involved with working on a railroad. Across the cramped cab, Myron Claridge, a retired crown counsel from Vancouver, is on his third trip to Chama, taking the engineer course a second time. On a steam train, the fireman makes power, but the engineer has control. “There is an element of universal lust, a desire to be in control of something so immensely powerful,” Claridge says. It’s also a personal challenge to master something so uniquely difficult. For him it’s agonizing, but fun. Perched on a narrow vinyl-covered seat, he cranes his neck to peer around the boiler and through a tall, skinny window at the tracks ahead, then turns his attention back to the Rube Goldbergian array of pressure gauges and release valves. Behind him, engineer instructor Russ Fischer guides him with cues to Ease it up! Let it off! A little more, a little less. Two pulls on the whistle—now the brakes! The students rotate through the cab all morning, resting between shifts in an open gondola. Most visitors on the passenger train spend the ride awed by the atlas-cover scenery, but for these students, the snowy peaks, aspen stands, trout streams, eagles, and elk are just a bonus. They’re tickled by the infrastructure along the track, the old rails and piles of discarded ties, the shingled telephone boxes and towering trestles. History buffs who come here know they’ll arrive in Chama to find the original depot, roundhouse, coal tipple, and water tower, five working locomotives, and rows of historic rolling stock, much of it still in service: more than a hundred boxcars, coaches, gondolas, refrigerator cars, tank cars, rotary snowplows, even double-decker sheep cars. All of this has been miraculously preserved, in part by fate, as economic conditions never made it feasible to convert the line to standard gauge, or to upgrade to newer locomotives. But most of the credit goes to the devoted preservationists who saved it from the scrap heap after the line was finally decommissioned in 1969. Above: Aaron Curtiss fires it up. Charles Proudfoot, the minister, is one of them. 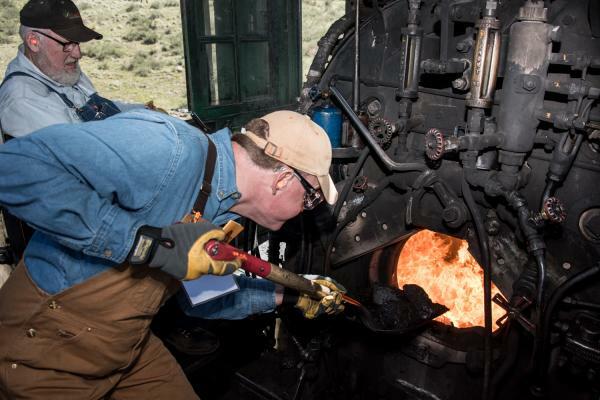 For 40 years he’s been studying the history of this line, sharing his knowledge as one of the dozens of volunteer docents and helping to restore one of the old locomotives. All day, he drops regular tidbits of trivia for his fellow students, details about this particular engine or that mile marker. The railway first caught his eye in 1969, when he saw a photo essay about it in Trains magazine. At 70, he is a first-time fireman, here with his son, Scott, who is making his third visit, to refine his engineering skills. Shoveling coal as his son manages the throttle, he appears thrilled, perhaps a little winded, and, glancing across the cab, extremely proud. Halfway through the day, we get word that a finicky part is plaguing the tender of the passenger train behind us, so we’ll have to wait for it to arrive at Cumbres station, then swap locomotives so it can go on to Osier. The 170 visitors on the regularly scheduled ride take precedence over our student-driver freight train. This means a significant delay for our lunch and an hour spent watching a crew from Chama jack up the tender and fix the fussy wheel, but the students could not be more thrilled. They’re happy to help the passenger train and fascinated as the crew miraculously lifts the 100,000-pound tender, still heaped with coal on top of its water tank. Through the afternoon, the students refine their coal-throwing, steam-building, temperature-regulating, and whistle-blowing skills. They must all be exhausted by the time we pull into Chama, but instead of scampering over to Foster’s Hotel for a much-deserved beer, they linger in the yard to watch the crew shuttle back and forth, putting the student train to bed and readying the morning’s passenger train. They chatter animatedly about tomorrow’s run and what they might do when they come back for the next class in the series. They’re enthralled by the power of running the train, and for most, this is the only way to get that thrill. Fireman student Bob Bidwell, who runs a temporary staffing company in Denver, isn’t used to shoveling coal, although he says it’s not much different from shoveling snow. At the end of this first day, tired and sooty, he’s already sold on coming back for the engineer program and maybe even the advanced class, in which he’d get to run a freight train, learn the switches, and move cars around the yard. Bidwell is only five hours from home, and train school is about as good a summer vacation as he can think of these days. “As you get older, it’s not as much about the place you go. It’s more about the experience,” he says. 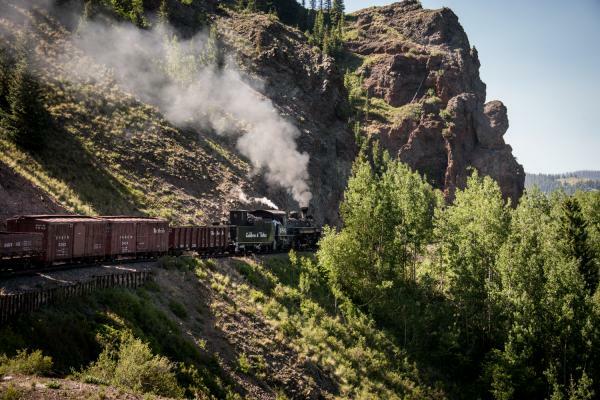 Cumbres & Toltec Scenic Railroad excursions depart daily from Chama and from Antonito, Colorado, through October 21. Kids can meet Santa Claus on special short train rides that run every hour December 8–9 and 15–16. Engineer & Fireman School admits 12 students for each four-day beginner session; there are five sessions between June and October. The last 2018 session takes place October 7–10. One advanced class, held in September, for those who have already completed fireman training and engineer training, has a capacity of six students. All of the classes sell out far in advance, but there is a wait list and spots do open up (cumbrestoltec.com).